Earlier in the year we were amazed and truly honoured to have been nominated for the above award by the Bishop of St Albans and we are now very pleased to announce that we have been successful. The attached press release gives more details on the award which is the highest award a voluntary organisation can receive in the UK, described as the MBE for a voluntary organisation. None of this would have been possible without your support and of course the hard work and dedication of our team of volunteers. We, on behalf of those we support, would like to thank you all very much and hope that you will continue to support us as we still need your help as much as ever. As ever thank you all for your continued support, we really couldn’t do all we do without you. Apologies for the delay in updating the blog, things have been very busy of late. We have a number of exciting events coming up in the next few months. First is a charity cake baking competition with the wonderful Bakehouse St Albans as part of the Harpenden and St Albans Food festival this month. Are you the next budding amateur baker in the district? Think you bake the chocolatiest chocolate cake in the city? The best biscuits in town? If so, why not enter for your chance to be one of 20 bakers competing each day. See the Bakehouse website for more details and an application form http://www.localbakehouse.co.uk/bakeoff/4590388035 Each day from the 27th of September a charity will be the nominated recipient of funds raised at the event as cakes submitted will be sold after the judging process with proceeds going to the charity of the day. We will be taking part on the 29th of September so grab that self raising flour and whisk up a marvel for us if you can ! On the 14th of October there will be another fashion show with the fabulous Chloe James Lifestyle store at the Cote Brasserie in the High Street in St Albans from 7.30pm. Tickets will be on sale shortly from Chloe James store at 12 The High Street 01727 843431 http://chloejameslifestyle.co.uk/ or email enquiries@chloejameslifestyle.co.uk Always a very popular event ! 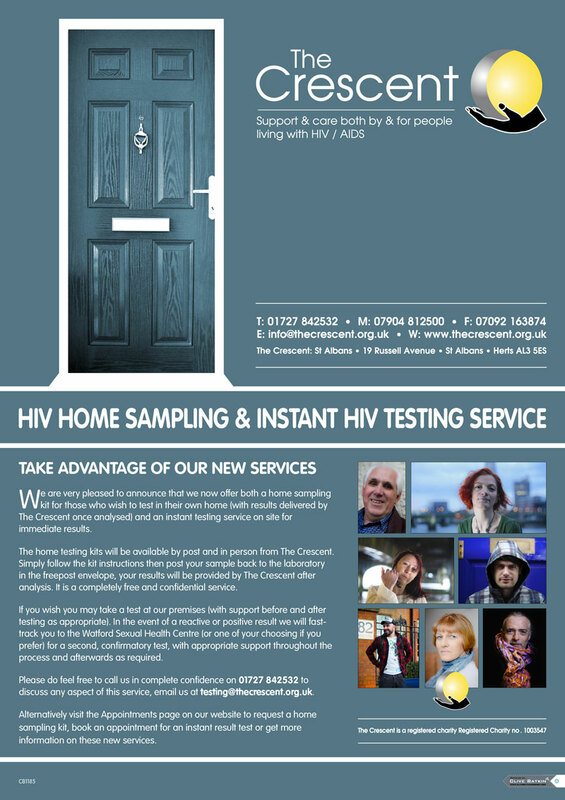 On the 5th of December we will be having another busking day and awareness event for World Aids Day. 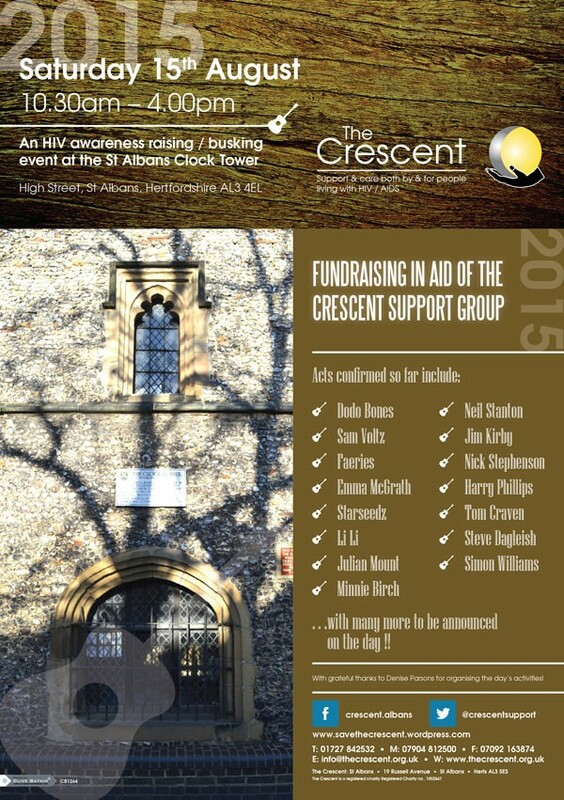 This will be at the clock tower in St Albans High Street as before, A free event for all. A full running list of performers will follow shortly but do make time to come along on the day if you can. More details will be published as we finalise the running order but we expect that the event will run from 11am to around 4pm. If you would like to help out on the day with collections or information distribution please do let us know on 01727 842532 or email info@thecrescent.org.uk. 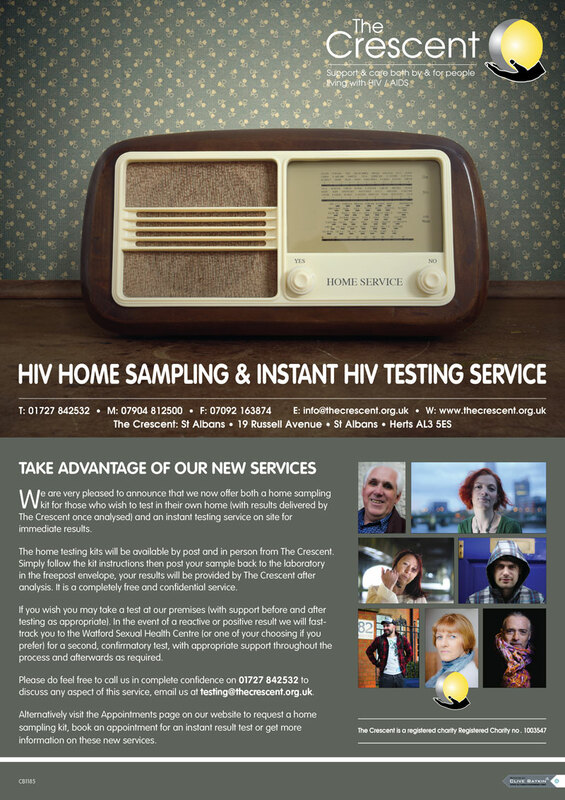 We are also pleased to see that Barnet Council are now offering a postal HIV testing service very similar to ours, it is a pity that Herts County Council won’t fund this here, and makes it all the more imperative that we raise funds to keep going. Please if you can come along to any of the events in the next few months we would be very grateful. Without your support and generosity we cannot do what we do!